I have been writing a cookbook for several years, and have yet to try to get it published. My husband keeps telling me that if I will just finish it, it will sell. I need to just have the guts (and the time) to go for it, silly me. To prepare chicken use 2 shallow bowls with flat bottoms and a plate. In the first bowl, beat together the egg and milk. In the second, place 2 cups cracker crumbs. Using a fork, dip each piece of chicken into egg mixture, and then place in crumbs. Using fork, scoop crumbs over top and press with back of fork. Shake off excess crumbs and transfer each piece to plate. Now to the cooking part. Use a stainless steel skillet for best results – non-stick coated pans tend to burn the breading. Heat oil & shortening in skillet over medium-high heat and then add the chicken. Cook to a light golden brown for approximately 7 – 10 minutes on each side depending on thickness. When cooked through, transfer to another clean plate with 3 layers of paper towels to blot away excess oil. This is the way to a husband’s heart through his stomach! 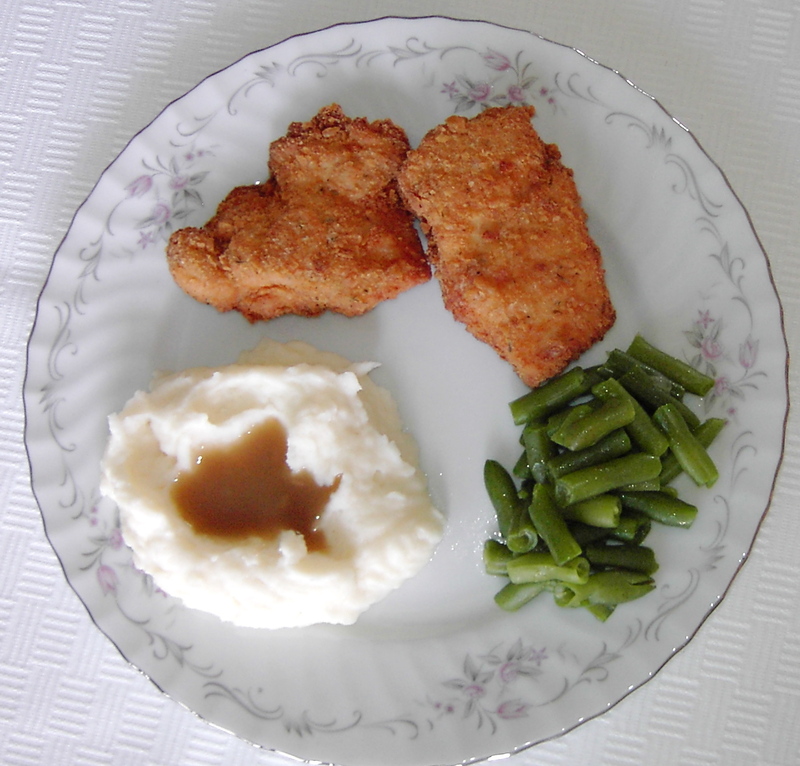 Serve with mashed potatoes, turkey gravy (non-fat from a packet, made in the microwave) and either green beans, corn on the cob or a salad and frozen biscuits baked in the oven. This is a huge meal, best saved for Sunday dinner.